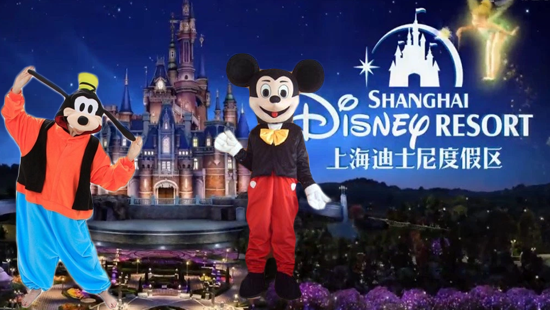 (P1) Disney opens a theme park in Shanghai, China. It has a grand opening ceremony. Many people come. Disneyland is a big investment. It costs 5.5 billion dollars to build. (P2) China is becoming a better and better place for investment. This is good for China and America, too. (P3) There are 330 million people at the theme park. These people have enough money to go to the park. These 330 million people can get there in 3 hours. Do you like Disney? Why or why not? Which Disney character do you like (e.g. Mickey Mouse, Goofy, etc.?? Why? Have you ever been to a Disney theme park? If yes, when and where? If no, do you want to go? Where did the new park open? How many people were at the new Disney? (P1) “Many people come” Should be ‘came’, yes? (P3) “These 330 million people can get there in 3 hours” Where are these people coming from and what transport got them there in 3 hours? If you click on the link to go to the article source, you will find 3 levels.The article above is level 1. Check level 2 and 3 to find answers to some of your questions about (P3) in level 1. I’m not the author/writer of the article but in my opinion, I agree with “come”. The sentence before. is in the simple present, so the writer maintains the simple present in the next sentence.